I was dead tired when I got home so I really couldn't be bothered with anything special. 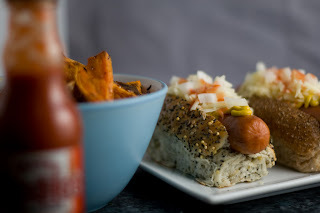 You will hopefully know how to cook hotdogs, the sweet potato fries is almost as easy... Heat the oven to 220c. Wash the sweet potatoes and remove any blemishes you don't want to eat. Slice them into chunky fries. Pop them into a big bowl, pour over some olive oil and chuck on some flaky salt and mixed dried herbs. Mix well. Put them on a baking sheet lined with baking paper. Bake for 30 - 35 minutes, or until done to your liking. Rotate the baking sheet with even intervals to make sure they cook evenly.